It’s been loud around the shop lately – and not just because of our press. Wedding bells have been clanging all summer long with our massive influx of wedding invitations needing to be printed! All jokes aside, we’re happy for all these couples and glad we were able to provide them with some beautiful and fancy invites. Most of these were brought to us by other designers, so it’s really wonderful to see the level of talent in our community and to be able to help finish their work off with the perfect high-quality craftsmanship we strive for. 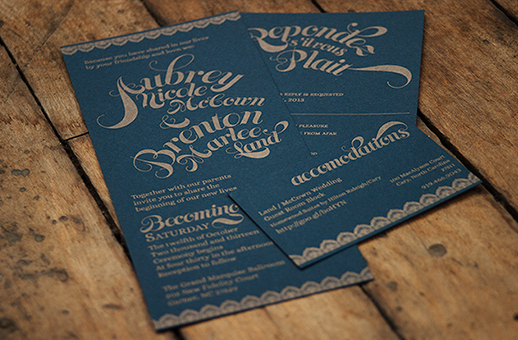 Using good ol’ classic letterpress printing, edge painting, blind debossing, die cutting and metallic inks – we definitely covered all our bases with these invites. 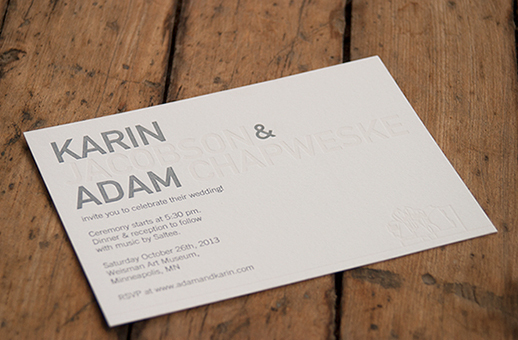 Posted on November 14, 2013 by Angel Bomb and tagged design letterpress.